Everything that frustrates me about retail real estate has been solved. Today, Storefront – an Airbnb for pop-ups, unveiled a new ranking system called RetailGrade; a patent-pending algorithm designed to find brick-and-mortar retail the best rental by taking into consideration the surrounding area and viability. You can literally search any address. This is the stuff of retailer’s dreams. Retailers and space owners have long needed a simple way of identifying retail opportunities. This is currently a convoluted process of site tours, speaking with brokers, and hacking together a myriad of online research. RetailGrade is like taking the data in broker’s heads and making it available to everyone; from Walmart to pop-ups; Storefront is the hook-up for an easy go or no-go expansion decision. You have to do nothing more than punch in an address and the algorithm crunches public data sources to serve up a grade for foot traffic with purchase intent and feedback as to the sites viability. Through my experience at a retail REIT, retailers are mostly aware of the prime areas; it doesn’t take a full day of touring to know Park Ave or Lincoln Blvd are hot spots, just look at the asking rents. What is less known is where retailers can maximize quirky locations, healthier returns, and off the beaten path foot traffic. By studying the useful heat maps on RetailGrade, a retailer in a glance can quickly identify square footage that best captures their customer base in an intuitive way. 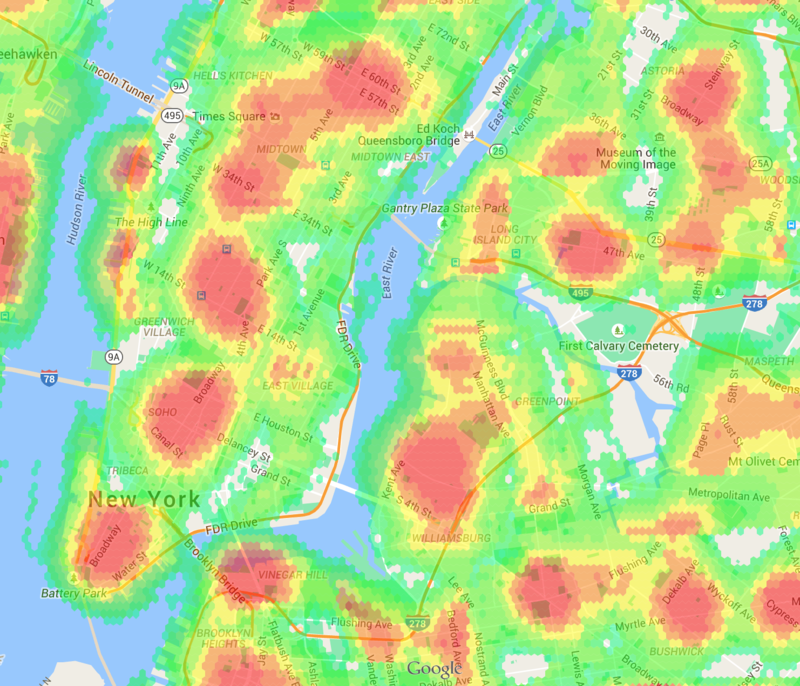 For instance, here is the heat map of retail opportunities in New York City. In green, we see areas that are less retail centric but could offer an opportunity to grow a business. These blocks still have a populated residential area that might work best for pop-ups that drive traffic via social media or be better suited for a night-time pop-up. The red areas are superb retail with close proximity to other retail and the orange offers strong foot traffic. This is an entirely new way to canvas retail without relying upon imperfect and often conflicting anecdotes. For space owners, RetailGrade is a way to indicate if your space is in high demand and generate ideas for a tenant base. The best tenants see strengths in your space in unique ways that others find valueless. RetailGrade can help the landlord and tenant see eye-to-eye on the retail opportunity, thereby making each space more monetize-able than before. The aforementioned use cases are just the tip of the iceberg. Retailers can grade their existing storefronts, in addition to strategizing new locations in unfamiliar markets. The benefit being that retailers can look before they leap, which begins with desktop due diligence via RetailGrade and eventually a pop-up launch with the Storefront marketplace. Taking the guesswork out of real estate and testing and stressing your assumptions is something that retail real estate professionals know well. This is just bringing hard data into the picture to be sure we’re getting a comprehensive and unobstructed view of the subject space. Most of you would agree, the greatest real estate tech is that which empowers the end user. Many in CREtech are fervently working on the problem from all different angles and asset classes. I can definitively say that the Storefront team is doing more than they’re fair share in retail real estate. It’s refreshing to see Storefront release a granular data tool and shift our industry in a meaningful way towards transparency. Grading retail real estate is finally data driven.